Today I want to recommend an awesome series from australia that I binge-watched like a crazy addict in maybe 3 days. The series is called PLEASE LIKE ME and it's all about the life of Josh Thomas. Today i wanna introduce an american TV-show that I'm loving alot right now. I found out about it on Youtube because I was checking some BROAD CITY stuff (also a great show!!!) and I randomly saw this great TV-show: THE CHRIS GETHARD SHOW. 5. the guests of the show who are invited are mostly pretty good comedians, actors etc. Riot Grrrl Movement Is Back - And This Are Some Bands! Yes, the 90's were great - thanks to awesome bands like Bikini Kill, Le Tigre, Sleater-Kinney and many more who kicked the asses of the male dominated punkrock music scene. the band from Philadelphia plays 70's stylish rock and punk music which has alot rhythm! Sheer Mag played a show in Berlin some months ago in a self-governing punk location. a feminist pop punk band from Seattle who got great catchy songs! Tacocat played some months ago in Berlin at Schokoladen and it was super fun. three-piece-band from New York plays wonderful poppunk music. I really love their song "Tearing Down Posters"
The show will be at Cassiopeia and the support band is also a big highlight for us: MODERN BASEBALL!!! It's gonna be soo great! One of my all-time-favorite bands THE THERMALS got a new record - it will be out 25th march. Until may 2016 the band will tour in the US, but probably they'll come to europe and germany soon to present their new record. I've already seen them once in Berlin @ Bi Nuu and it was really amazing. Great band! Best news of today: One of my fav bands is coming to Berlin this summer. Im talking about ROYAL HEADACHE from Sydney. 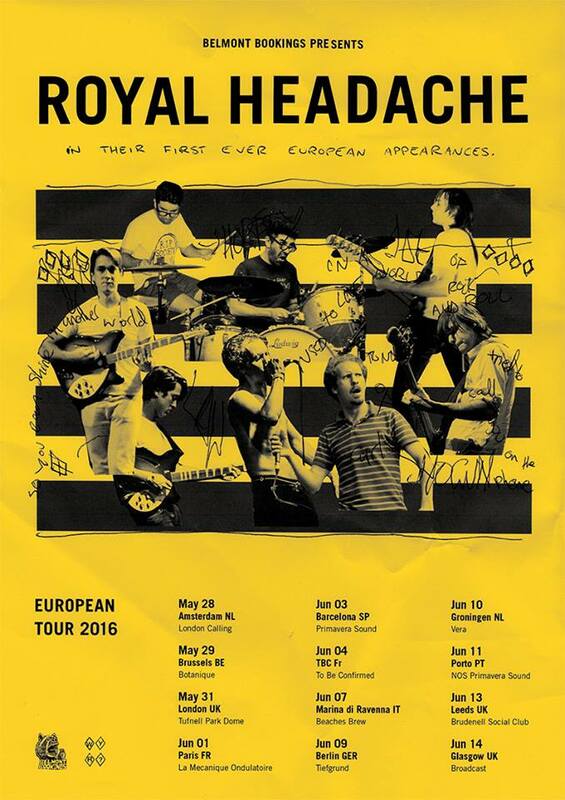 Im glad Berlin is on the list too because RH is on my "concert-wishlist" for a long time.